Updated Tuesday November 13, 2018 by John Rocchio. The 2018 Season for the CLCF Chiefs has come to an end. We enjoyed a successful season with all but one of our competitive football teams making the playoffs. Several made it to their level’s semi-final games and the 8U and 11U both made it to the BVYFC Super Bowls. The 8U team came up a little bit short but had a great game. Undoubtedly, these boys will be fierce competitors throughout their CLCF careers. Congratulations to Coach Gene’s 11U team for becoming the 2018 BVYFC Super Bowl Champions!! They overcame a first half deficit to defeat their yearly rival, the Lincoln Lions, after a second half comeback! We also want to congratulate our 10U CLCF Chiefs Cheerleaders for coming in 1stin the 2018 BVYFC 10U White Division Cheer Competition! We wish these girls Good Luck as they compete at Regionals this coming weekend! We ask that you make EVERY EFFORTto return the equipment on this date! Our Coaches have put in a lot of time already this season and are looking forward to enjoying their families as we head into the holiday season! We will not be making special appointments to collect the equipment, please make arrangements to have someone return the equipment if you cannot make on the above date! The information below can be used as a cleaning guide for CLCF Chiefs Football Equipment. Please take care of cleaning equipment on the day before turn in at the latest - sooner is better! If you try to clean it the same day as turn in, it will not be dry for turn-in. We ask that you return the equipment/uniforms in a way that you would want them handed out to your children next season. 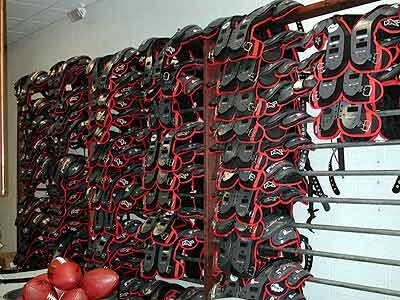 Spread out an old towel, lay out the pads, shoulder pads, helmet, etc., and let it all air dry inside your residence. Softly scrub with soapy sponge. You may lightly spray with Fabreeze (NOT Lysol). Wash with soapy sponge inside and out to remove dirt. Remove the chin strap. Soak in warm soapy water and softly scrub. Remove the mouth guard and keep or throw away (do not turn it in). Make sure to clean the points where the face mask meets the helmet - grass and mud can get lodged in the crevices. Thoroughly remove all temporary tape and tape residue. Thank you for your diligence and care of CLCF Chiefs Football equipment - your efforts help maintain the quality of the equipment and uniforms.